Warm Greetings on BSNLEU Foundation Day, 22nd March 2018. BSNLEU is 17 years old. 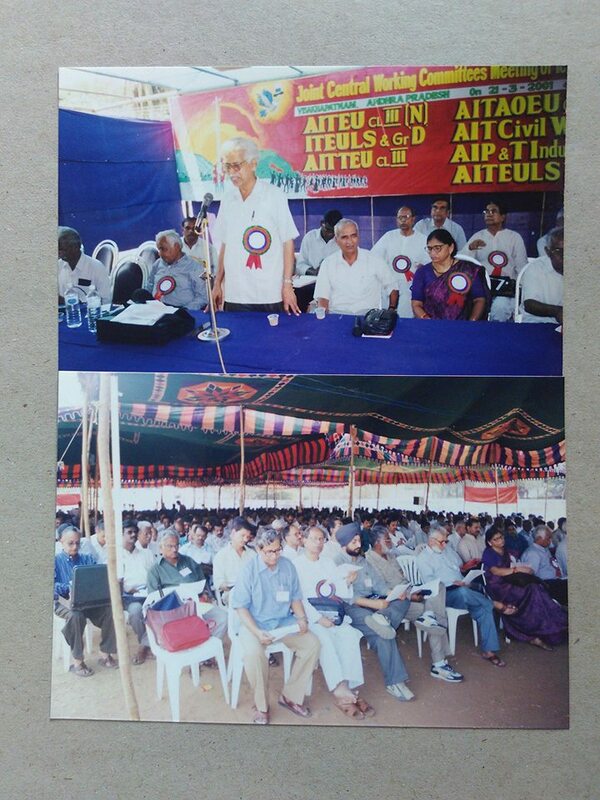 BSNL Employees Union, the majority recognised union of the BSNL workers, was formed on 22nd March 2001, in the National Convention of eight telecom unions held at Visakhapatnam, in the presence of Com. E.Balanandan, President of CITU and one of the greatest working class leaders India has seen. Though started with about 50,000 – 60,000 workers, it grew to be the biggest union in BSNL with more than one lakh workers, despite the fact that there was no recruitment and thousands were retiring every year. This was a herculean task, but the united team of the BSNLEU leadership made the impossible in to possible. BSNLEU as the recognised union separately, and also jointly with other unions, both executive and Non-executives, defeated the nefarious designs of the central government, both NDA and UPA, to disinvest BSNL, retrench about one lakh workers through VRS, unbundle the precious copper cables and so on. BSNLEU took the initiative to form the Joint Forum of the Unions and Associations, under which organisation, the battles were fought and the anti-worker decisions of the government defeated. BSNL and its workers are facing serious challenges to their existence. The neo-liberal policy initiated by the Congress government in 1991 and aggressively being implemented by the present BJP government is making it difficult for the PSUs to sustain and grow. The NDA government as per the recommendations of the NITI Ayog is moving for privatisation of about 70 PSUs this year, in which the name of BSNL is also there. Wage revision due from 01-01-2017 is being denied. To destabilise BSNL, a Tower Company is being formed, taking away the towers of the company, which will seriously dent the existence of BSNL. Pension Revision is also delayed / denied. However, after two days strike and massive Sanchar Bhawan March, the Secretary DOT and Minister has come forward for discussion and positive development is taking place on these issues. Sustained effort and struggle will be required to achieve the above demands. The two associations, AIBDPA and BSNLCCWF formed at the initiative of BSNLEU has grown and strengthened. The demands of the workers, the pensioners and the casual contract labours are interconnected and inseparable. That is why united struggle. It is in this situation that the workers are observing and celebrating the 18th Foundation Day of BSNLEU. Various programmes, including meetings and rallies are being held all over the country, observing BSNLEU Day. Let us remember our past struggles and sacrifices so that we can advance with more vigour, determination and strength.